This September I have decided to challenge myself for an extremely worthy cause Cancer Research UK. I won’t say too much about why I feel so strongly about Cancer Research as I have a post in the making for my reasons and inspirations. Today I am here to tell you that I shall be ditching Tea and Coffee two beverages that I drink A LOT of for 30 days. As part of Dryathlon the reason for this twist is as much as I like a good drink, I don’t drink enough alcohol to warrant that being much of a challenge. So in speaking to my best friend I decided to ditch Coffee and she challenged me to also ditch Tea as I drink a fair amount of both. So that is what I will be doing…today I will get in my last few beverages before I ditch them. I am looking forward to seeing how I cope and to see how much this change effects my health and fitness. I will be documenting my time, I won’t say every single day as that could get tedious for me to write and for you to read. So it will be as often as necessary. I think the first few days will definitely be the hardest for me. So I reckon you will hear a lot from me at the very beginning. I hope you will join me for my journey, any form of encouragement is welcomed. As I type this I have already raised £11 with £4 of that being from my almost three year old niece. If you would like to support me on my quest you can donate here http://www.justgiving.com/Hayley-thorpe-dryathlete2015 anything you can spare is appreciated. I have said to a few people I think Starbucks will be emailing me when my Starbucks card is not used for a while haha. I will be checking in with you guys tomorrow once I have undertaken a chunk of my first day. It tasted sooo good. I shall be having a coffee at work but I won’t be buying milk for the fridge. There will be no added temptations for me. I intend to enjoy today and the pressure starts tomorrow. Have a good Monday all. 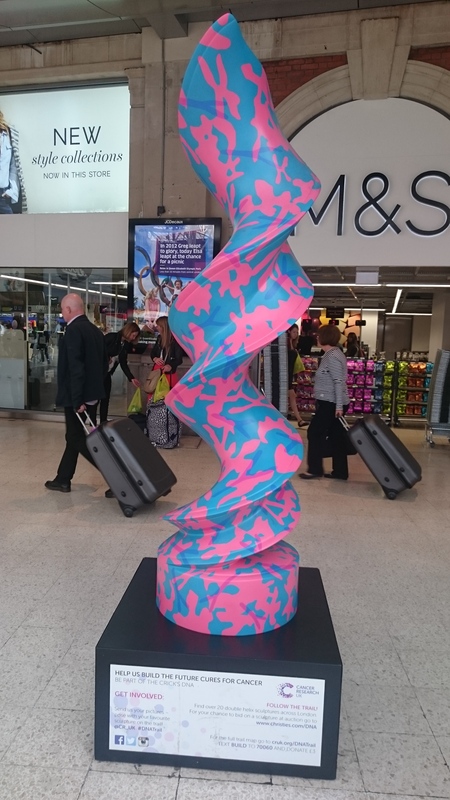 After I found the first one at Waterloo station I looked at the link on Twitter and decided I wanted to try to find as many as I can before the 6th September when the trail ends. I found out there was one at Victoria station, a station that I use daily to get to work so I made it my mission to find it and take another snap. I was a little offended if I am honest as I had to tidy the rubbish that was left there before I could snap my second #DNATrail picture. So far the first one I found is my favourite but I have a few stops to make before that is confirmed. This one is called Double Dutch Delift Blue DNA. Isn’t this pretty awesome?? 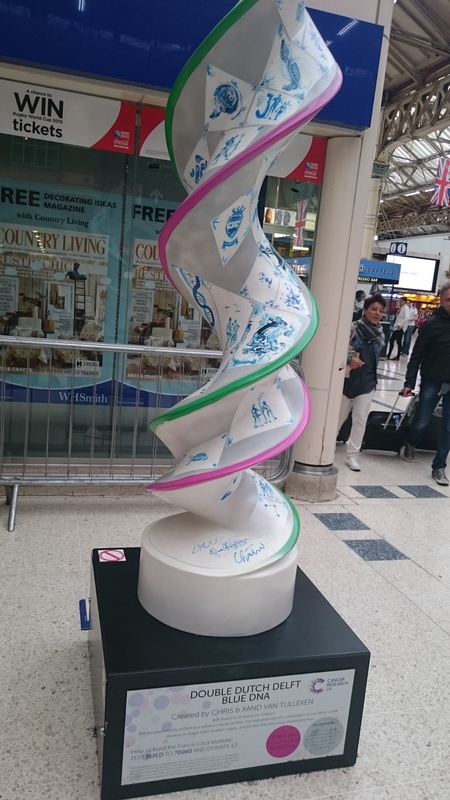 ?….I was awaiting some friends at Waterloo train station when I spotted this beauty and then I noticed it had Cancer Research UK on it and about the #DNATrail that has been all around London since the 29th June. I have until 6th September to try and snap a few more of these. I am a little annoyed with myself for realising so late, but I will attempt to get a few more up on here before it ends. 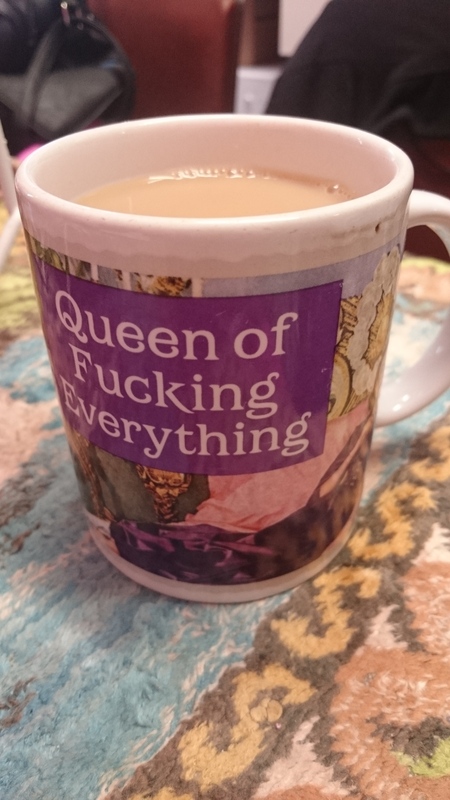 So here I am…embracing her wise words…I have so many ideas, thoughts and feelings that I will start to share with you all on my little place on the internet, but all in good time. Today I wanted to simply say hello and to get lifestooshortblogger up and running…I shall be setting up a Twitter account very soon. Dryathlon – with a twist coming in September – this will be heavily documented..
Life really is too short so how will you make your mark??? ?